Here are some facts about the Battle of Gettysburg, one of the most important battles of the American Civil War. The Battle of Gettysburg was fought between July 1 to July 3, 1863. The town of Gettysburg is in Pennsylvania. It is the county town of Adams County. The two armies contesting the battle were the United States forces, under the command of George G. Meade, and the Confederate forces, led by Robert E. Lee. Although the battle began as little more than a skirmish, by its end it would involve more than 160,000 combatants. The battle began on the morning of July 1, when two Confederate infantry brigades skirmished with Federal cavalry at Willoughby Run, just to the west of Gettysburg itself. When they encountered a Union cavalry brigade heading to the town of Gettysburg, the infantry brigades of Confederate soldiers were actually looking for shoes in the region. 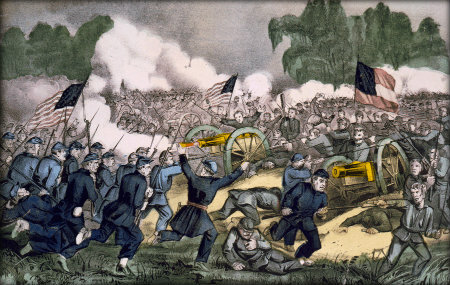 The Battle of Gettysburg is often viewed by historians as a turning point in the American Civil War, as it ended a period when Lee looked set to do major damage to the North, threatening many of its major cities. United States forces lost 23,055 men in total, with 3,155 of those killed, 14,531 wounded, and 5,369 captured or missing. Estimating Confederate casualties is more difficult, but it is estimated that approximately 28,000 soldiers were either killed, wounded or captured. Some historians have suggested that as many as 23,000 Confederate soldiers were killed during in the Battle of Gettysburg. In the November of 1863, US President Abraham Lincoln gave a speech, which became known as the ‘Gettysburg Address’. He honored those who had died during the battle, and gave the Civil War a renewed purpose. Lincolns Gettysburg Address was in 1863 not 1836 (this was the year of the Alamo). Well spotted. Will change it after I’ve written this! Many thanks.